Arrecifes Cabin is located in the Arrecife Beach. There are 6 cabins in 3 semi-detached building a few metros from the beach. To get there it's needed to walk about 45 minutes. You can also rent a horse to carry the luggage. It's important to know that to get to this cabin you must be there before 16:45 because the way must be made before night. . 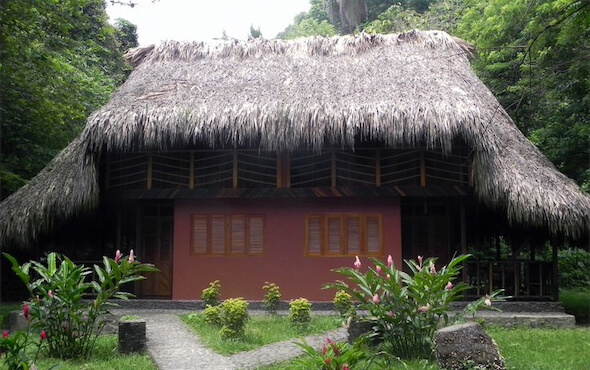 The cabins has a capacity of 5 persons in two rooms. There is a restaurant with delicious regional and international dishes. From the cabin you can easily walk one hour to the beach of La Piscina and in 2 hours to Cabo San Juan del Guía. The cabins counts with 2 levels and 2 separate rooms. On the ground floor there are two single beds, a bathroom with shower, hammocks and a ventilator, and on the first floor there is a double bed and an additional single bed, direct TV and a fridge, as well as a balcony with hammock. Outside you have a terrace with table and chairs. To enter the Tayrona Park it's needed to pay the entrance fee that is 53,500 for foreigners, 24,000 pesos for colombians and 18,000 pesos for children.